I started canoeing as a kid in the ’70’s. My dad had a 17 foot aluminum canoe that we would use for fishing on various inland lakes near our home. We didn’t do any canoe trips but we did a lot of fishing. I spent some more time canoeing in Boy Scouts and then finally went on my first trip to the Boundary Waters with some friends in 1987. We rented a boat, just a standard issue aluminum freighter, from Sawbill Outfitters. 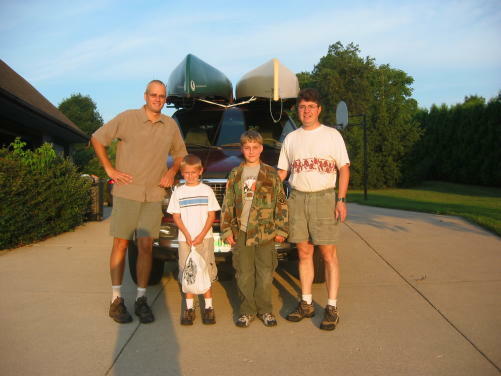 It was the beginning of an annual tradition of canoe trips. One of the key features that drew me to Mad River Canoes in general and the Explorer in particular was the design of the hull. The vast majority of canoes that most people are familiar with are flat bottomed. The first time most people get into my boat they say it feels “tippy” and it is compared to a flat bottom hull but it’s a feature you soon learn to value once you are used to it. There are two forms of stability in a canoe, primary and secondary. Stability, in nautical usage, is defined as resistance to change. It describes the ability of a watercraft to maintain equilibrium or its ability to resume its original, upright position after displacement. Displacement can occur from wind, waves, or as is typical in a canoe someone making a sudden move. Primary stability describes how a boat feels in flatwater in an upright position with no displacement. A lot of primary stability would serve you well as long as the boat was never displaced from an upright position. In reality displacement happens all of the time. Whether it is wind, waves, or a paddler’s movement the boat will be displaced from an upright position. This is where secondary stability comes into play. Secondary stability describes the ability to control or stabilize a boat once it begins to heel. Due to the nature of its design a flat bottomed boat has almost no secondary stability. Once it starts to heel it proceeds very quickly from upright and stable to capsized. It’s almost a digital transition. A flat bottom boat has a lot of primary stability and thus doesn’t feel “tippy” when you first get into it. However I suspect that most everyone that has paddled a flat bottom boat has found at some point that it has close to zero secondary stability. They typically find this out when they are in the water wondering how they got there. A flat bottomed boat goes from upright to flipped very quickly with little warning. In comparison, a shallow V hull makes a nice comprise between primary and secondary stability. It gives up some primary stability to gain secondary stability. Overall it is a much more controllable boat and will result in a lot fewer unexpected swimming experiences. Again, once you are used to this type of hull you will never want to paddle a boat that doesn’t have it or a form of it. I can lean my Mad River’s nearly to the gunwales and recover cleanly. You will never do that with a flat bottom boat. To my mind a shallow V hull or some variation of it is essential for any serious tripping boat. There’s a lot more to it than I just described. You can get some more information from Mad River by clicking on the image below which will take you to their catalog archive (see “Canoe Design Features, Performance, and Construction Techniques (Page 1) / (Page 2) / (Page 3) / (Page 4)” section). My Explorer has served me well on numerous lake and even more river trips for approaching 20 years. From my view it is the finest all around tripping boat you can buy. My only complaint is that it is a bit heavy at 73 pounds but this weight has more than paid for itself in comfort and reliability. It’s been on everything from flatwater to class II rapids and it handles it all without any issues. There are lighter boats (including the Explorer itself in fiberglass and kevlar), some of which I have paddled but I am always most at home in my Explorer. In fact, as I get older I have found that I get kind of crabby if I have to paddle another boat on a trip. My only modifications from stock were to replace the original cane seats with curved cane seats from Mad River including the addition of a third seat. All of the seats are slightly canted to accommodate kneeling as well as sitting. I also added a set of Voyageur float bags. This entry was posted in Outdoors, Paddling. Bookmark the permalink.